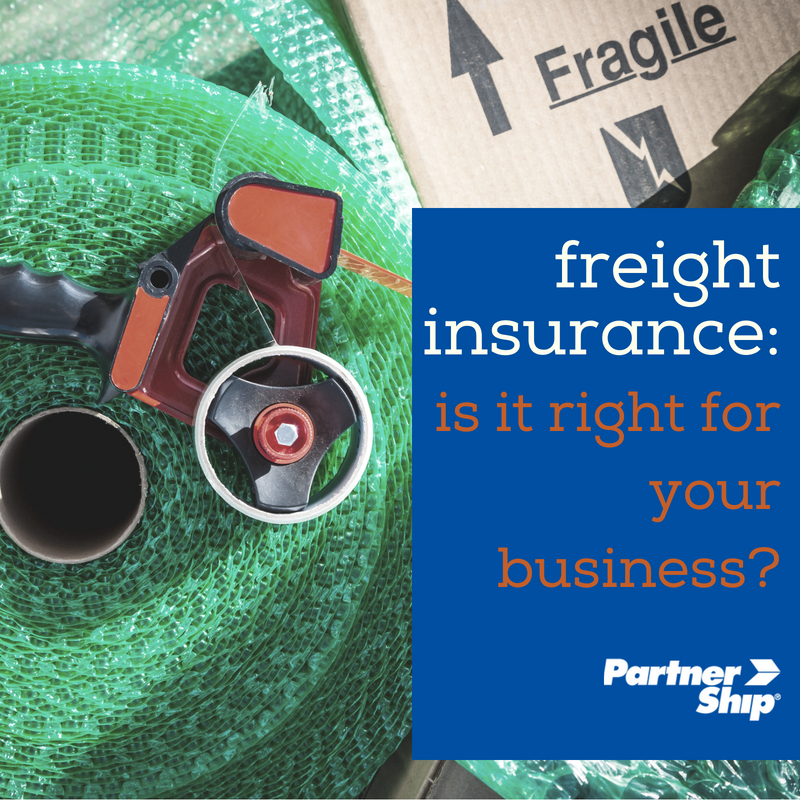 Freight Insurance: Is It Right For Your Business? Let's face it: ship happens. Even though many shippers prepare for the worst and do their very best to protect their freight, loss and damage are an unfortunate reality of the business. Freight insurance is a vital tool that business owners can use to offset the costs of freight damage and limited carrier liability. Unfortunately for many shippers, freight insurance coverage can be complicated to understand and is often misunderstood. How do you know if you should be using freight insurance? First and foremost, it is important to understand the difference between freight insurance and carrier liability. Carrier liability is an industry term used to describe the responsibility of the carrier as it relates to losses, damages, and delivery delays to compensate the shipper. Of course, exceptions are put in place by the carrier, such as whether the damage or loss is a result from the action of a shipper (ex. improper packaging), an act of God, public authority, or due to the inherent nature of the goods. It is the responsibility of the shipper to prove that the damage or loss of their shipment is a direct result of the carrier's own negligence. To accomplish this, it is important to take pictures of your packaged freight before the pick-up is completed, and inspected thoroughly once it is delivered. Any damage or loss MUST be noted on the delivery receipt. If your shipment does not encounter any issues, it is important to properly follow the claim filing process within 9 months of the delivery date. You have even less time with a concealed claim. At 5 days max, it is extra crucial to get the process moving along promptly. But here's the thing about carrier liability: even if you can win a claim against the carrier, the payout often doesn't cover the total cost or value of your freight shipment. Every carrier has an established payout amount, usually per pound and depending on the fright class and limit of liability. Additionally, there are many exceptions and limitations as well as restricted types of freight that are compensated for even less, such as some electronics, artwork, and furniture types. The good news? Freight insurance does not require the shipper to prove that the carrier was at fault for the damage or loss, simply that the damage occurred. It's a great way to protect you and your customers and to be sure your shipment can be covered for its full value. Freight insurance is often offered by third-party insurers at a fee on top of your carrier rate for transit. So how do you know if it's worth the extra cost? If you are shipping products that are fragile and may break easily, it's a good idea to seek out additional freight coverage. Most carriers have their best interest in mind, and only offer limited coverage on these types of shipments, knowing there is a higher potential that they may break in transit. So if there is damage, it's unlikely you will get the full value of what has been lost. Proper packaging can help mitigate the likeliness that damage may occur, but the loading and unloading process doesn't always go as planned. Damage can occur at pick-up and destination delivery, as well as the many times your freight may be loaded at various terminals throughout transit. There are carriers who specialize in the transport of fragile shipments, commonly referred to as white glove service providers, but this alternative can be costly and still may have limited coverage. Freight coverage purchased through an insurance provider is typically based on the declared value of your freight and can help give shippers peace of mind. Similar to those who ship fragile products, businesses who are transporting high-value goods need to be mindful of how much coverage they receive through limited carrier liability. Just because your shipment isn't particularly breakable, doesn't mean your freight is protected in the event that it can go missing or may be delayed. While unlikely, it's always a good idea to have a plan that will cover your back, and your bottom line. Carriers typically pay out by the pound. For example, it's not uncommon to see a pay out of $0.25 per lb or even less on restricted items for less-than-truckload, with a max cap of $100,000 per truckload. With many types of freight insurance coverage through different providers, the total value of the shipment is covered, despite whether the carrier accepts responsibility or not. Of course, it's always crucial that shippers are diligent and fully understand the terms of their third-party insurance coverage, no matter which provider they go with. Another important consideration for businesses concerns their supply order or inbound shipments. Typically, a vendor will determine this portion of the shipping process- choosing carrier, service type, and rate. Taking control of your inbound shipping is crucial, both in reducing costs and selecting the carrier that best suits your needs. But, apart from that, how can you better protect your inbound shipments against damage during transit, especially when as the receiver, you aren't even there to check on proper packaging and material handling? Enrolling in an inbound freight insurance coverage plan can help mitigate the cost of damage and help business owners take back control on their inbound freight. It's safe to say that if you are shipping high value freight, fragile products, or receive inbound shipments, it is crucial to take a look at supplemental freight insurance options. At PartnerShip, we want to offer better coverage than the typical limited liability offered by the carrier because "one size fits all" just doesn't cut it. The shipping experts at PartnerShip can help you decrease your risk and increase your peace of mind. Contact us at 800-599-2902 or email sales@PartnerShip.com for more information about freight insurance, or get a quote today.